Play Along and Learn with Two Legendary Artists! This captivating session brings together two undisputed giants in the field of bluegrass guitar. 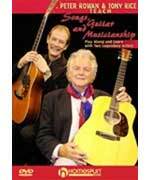 Peter Rowan and Tony Rice teach great songs and pass on the techniques, musical insights and wisdom they have gained through decades of experience. This lesson will help players at a variety of levels: If you are an intermediate guitarist, Peter’s rich chord ideas and solid picking will guide you to successful song accompaniment and rhythm playing. If you’re ready to venture into more advanced territory, Tony’s unique back-up ideas, chord inversions, licks and mind-bending solos will provide months of exciting study. Everyone, regardless of skill level, will enjoy and learn from the instrumental and verbal interplay between these amazing musicians. As you learn to play six of Peter’s classic songs, your skill and musicianship will develop to a whole new level and you’ll gain an understanding of how to bring your own songs to life. Includes: You Were There For Me, Dustbowl Children, Let the Harvest Go to Seed, Angel Island, Come Back to Old Santa Fe, Panama Red and a special performance of Midnight Moonlight. BONUS: Seven electronically slowed-down solos for detailed study.